In its infancy, much of Cole County was settled by immigrants moving west. Many of these new pioneers formed Baptist churches. Later, new immigrants from Germany and other parts of Europe began calling Cole County home as well. With the influx of German immigrants many Catholic, Lutheran, and Methodist churches began sprouting across the countryside. Below are all known churches in Cole County. Click on the name of the church to be taken to a page with additional information and photographs. 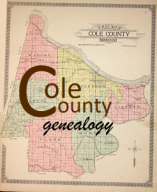 Thanks for visiting the Cole County Genealogy Website! Visit these other great sites!